After overwhelming success in its first year in 2008, Banff National Park is hosting the second annual Banff National Park Bike Fest road race event. Registration is now open for the Alberta Bicycle Association (ABA) sanctioned event taking place June 18 through 21. This year's event will feature seven road races including an Individual Time Trial, Criterium and an Invitational Road Race and two new races: a 6km Hill Climb and 80km Sprint Road Race. 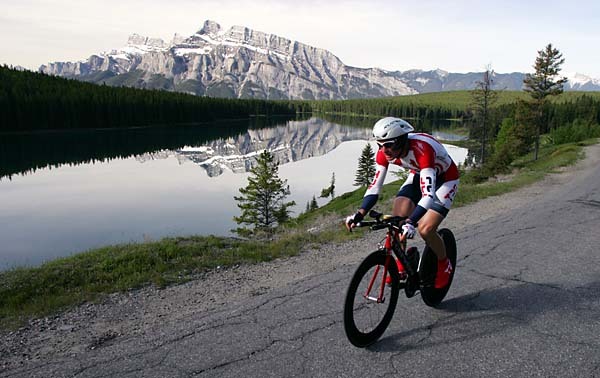 Cyclists will be racing through the streets of Banff and throughout Banff National Park over the course of four days. The athletes can expect tough and challenging courses with hairpin turns, breakaway sprints and fierce competition while spectators can enjoy the awe-inspiring scenery and be part of the excitement as cyclists whip past at remarkable speeds. "What makes the Banff event so special is that no other race takes place in a National Park surrounded by such spectacular scenery," says Kipp Kauffman, executive director of ABA. "Last year's event was so successful there has already been interest from teams throughout Western Canada and Washington state." The weekend will also feature two family-friendly events. The Little Crits Race will have kids from three to eleven years old racing their bikes along the same course the pros do and the Cruiser Crit will have participants donning fun costumes and riding brightly decorated bikes as they race through the streets of Banff. "Last year Bike Fest drew thousands of spectators and hundreds of high caliber athletes," said Julie Canning, president and CEO Banff Lake Louise Tourism. "We are ecstatic to again be hosting this event and putting on the finest bike racing event in the Canadian Rockies." You can find complete information on Banff National Park Bike Fest at the BikeFest website. Also available additional information on hotels, activities, restaurants, events, and more.